Home People Brilliant and Black What Do You Do With a Chance? As adults, we can choose to take an unexpected chance to try something new, or we can ignore it. But what if an amazing chance presents itself to a very young child? What does he (or she) do with it? Does he take the plunge…or hide from it? That’s the premise of a new picture book called What Do You Do With a Chance? by author Kobi Yamada. 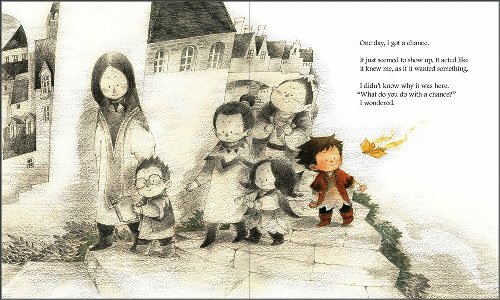 In the book, a young boy of color is minding his own business when a “chance” shows up out of nowhere, flutters into his field of vision like a little yellow butterfly, and “acts like it knows him.” It wants something from him…but what? The young boy is flabbergasted. He did not ask for this chance and he certainly doesn’t know why it has chosen to come to him instead of anyone else. He does what most people do when they’re not sure of their chances to succeed in a new opportunity: he turns away. When a “chance” makes itself known. What Do You Do With a Chance? 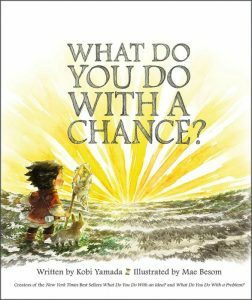 is the third installment of author Kobi Yamada’s What Do You Do With?… series that leads children and adults to consider the possibilities in their lives. Mr. Yamada’s prose is realistic and on-point, and leads readers to reflect on whether they’re living life to its fullest. Also, watching the young boy ignore his chances and then wonder why they come around less and less is like re-living past chances we decided to ignore in our own lives. Artist Mae Besom, who also illustrated Books 1 and 2 of this series, does an outstanding job of personifying the “chance” that presents itself in the form of a playful yellow butterfly. The rest of the illustrations are done up in soft grays and pencil tones, and this contrast in color suggests the way our real lives unfold: everything is gray and/ monotone until we do something different and bring some color into our lives. Use this book to start discussions on taking chances, getting outside one’s comfort zone, recognizing opportunities, and learning to look for something different in this “same-old, same-old” world we live in. This book is great for the classroom, but it’s also equally as important on your child’s personal bookshelf. Enjoy. And take a chance! PS – Please note that a variation of this review appears on our sister website, Picture Book Depot. Previous articleWhat Do You Do With a Problem?